Inspired by the Ko Bi Do, this lightening massage focused on the face, the shoulders and the neck, rebalance your emotions and energy. A reflexology of the hands and feet prolongs this moment of well-being. You will like if you do not like body massages and love to pay special attention to your face and skull. ... If you are tired and need to detoxify your face to look radiant. ... If you do not want to undress completely. Etoile is a sensory journey designed around 3 techniques, inspired by the Ko Bi Do "Voice of ancestral beauty", to give your skin its natural radiance. The first movements of smoothing and effleurage will bring you a deep relaxation. Then the facial Shiatsu will boost your energy points by working on meridians and reflex zones. Finally, drainage maneuvers will allow the evacuation of toxins. Your senses will be alert and your mind appeased, reflexology, practiced on your hands and feet, will then be a perfect complementary extension of this moment. 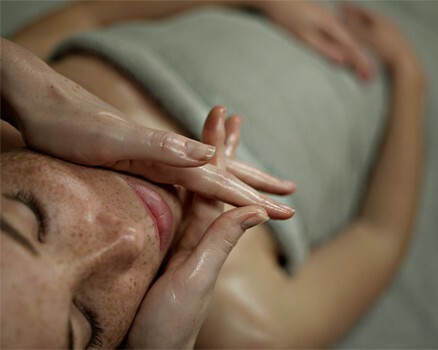 To fully enjoy this signature massage, take a moment for you at the spa with swimming pool, sauna and hammam ... and enjoy a Face Treatment to accentuate the benefits of the Etoile massage. After this massage, we propose you a Hand or a Feet treatment.